In Tsukuba you can never be very far from a rice field. So even in the parts of our fair city most distant from the the flooded paddies of spring and summer you can still hear a WHITE NOISE, or distant hum. Naturally, when you get nearer, this sound grows louder, and if you find yourself on a road adjacent to or sandwiched between the TAMBO (rice fields),you might be in for an overwhelming auditory experience. For some, especially those who live nearby, this might be annoying, and for others, such as vistors from Tokyo, it might even be frightening, but one thing is for sure- interesting in rhythm and tone color, and filled with an intense sense of yearning, the nightly chorus of male frogs crying out for mates is SIMPLY AMAZING! An encounter with this exuberant, annual, multi-million-year-old NATURAL nocturnal choral festival ( one of nature`s oldest, and musically, surely its richest ) might be comforting for those people who have been concerned over reports of dramatic decreases in frog populations worldwide. 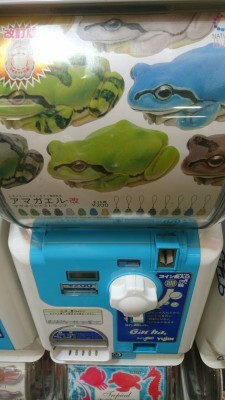 I can assure you, however, that no matter how noisy the frog chorus in Tsukuba sounds to you now, it is a mere shadow of what it was just a few years ago, when I sometimes would find it impossible to carry out a phone conversation in my house because of the high decibal KWA KWA KWA-ING of the frogs. This OBVIOUS drop in numbers has not only been brought about by habitat destruction, agricultural chemicals, pollution, ozone depletion and road kill, but also because of a fungal disease which arrived in Japan a few years ago, and has taken its toll on certain of Japans frog species. Still, the fact that the frog chorus continues to resound throughout our city attests to a relative environmental well-being (as compared with Tokyo and other big cities), as frogs, like canaries in coal mines, can be seen as a measure of an ecosystem`s health. They are also a key link in the food chain, consuming massive amounts of insect pests,while they, in turn, are a major source of nutrition for the egrets, snakes, weasels , etc who prey on them. In this season, late May, while the mosquitos have not yet emerged in full force, as often as I can, I forget about my cd collection, the radio or tv, and head on out to the paddies for a serious listen to natures greatest night-music. You should give it a try yourself (you can even do this by stopping the car by the rice fields, rolling down the window, and stopping the engine for a while). There are 43 species of frog found in nature in the Japanese Archipelago ( and about 4000 in the world), though in Tsukuba`s ponds and rice fields you will probably only encounter 6 or seven of these. 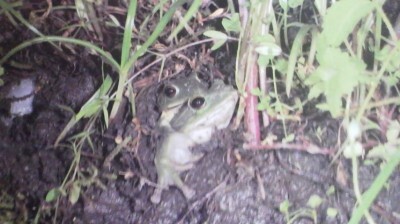 By far the most predominant of our local frog residents are the small, green (though they can change color to brown or even blue!) 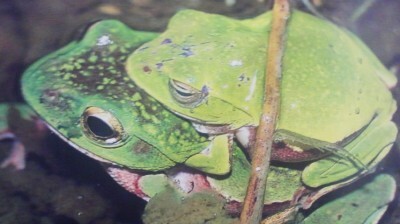 AMAGAERU (tree frogs), which overwhelmingly make up the main vocal body of Tsukuba`s frog chorus. For me, their call`s tone color resembles orchestral strings, with a cricket -like drone. The amagaeru`s crying is also used by Japanese in many regions to predict the weather (since they sing not only for mates but also in response to changes in humidity and changes in air pressure). 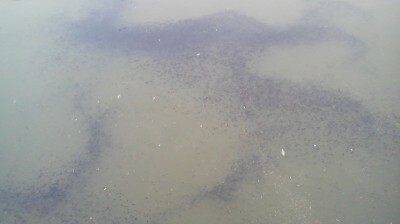 The croaking of amagaeru in the day time might very well mean that it will soon rain. 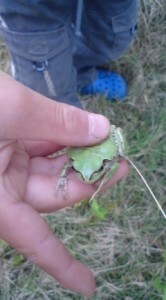 These frogs have suction cups on there fingers and are very skillfull climbers. You might find them on trees or even on the walls of your house. 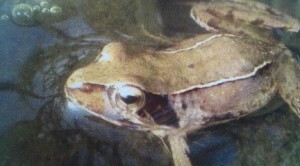 The amagaeru are often so boisterous that in some spots it is difficult to make out the calls of the other frogs. However, since this species stops singing at around midnight, the wee hours of the morning make a good time to get a better listen to the less numerous croakers. Most similar to the AMAGAERU in size (3-4 cm) and color is the Shuregeru Gaeru ( named after the German naturalist Schlegel). 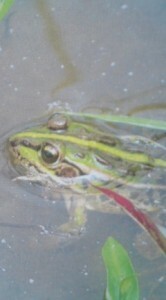 The tone of their cry sounds more to me like a croaking or rapid rapping on hollow wood. This frog lays its eggs, which look like a white foam, on bushes,tree, lawns, etc. The easiest way to distinguish the SHUREGERU from the AMAGAERU is that the latter has a black line which runs horizontally from its eye. The AKAGAERU, which actually lays its eggs in the paddy fields, is larger (4-6 cm) than the AMAGAERU, and is a deeper green. It also has two spines (creases ) down its back. Its call remains me of the clucking of chickens- in short bursts. The Tokyo Daruma-Gaeru is about the same size as the akagaeru, but it has spots on its back. It makes its song, a machine gun-like rapid clucking (reminds me of a penguin colony), by expanding two cheek-like pouches. 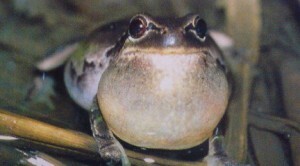 Probably the easiest voice to distinguish, the bass part of the chorus, is that of the USHI-GAERU, the bull-frog, which arrived in Japan from the US in the early 20th century and has been able to spread itself out ( and making a pest of itself) around the country. 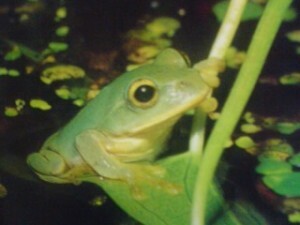 Since frogs have inhabited the all-important paddy fields since rice was first cultivated in Japan (somewhere between 300 BC- and 3oo AD ), and because they help control harmful pests, it is not surprising at all to find out that Japanese farmers in some areas have traditionally believed that the frogs were manifestations of or messengers of the God of The Rice Fields ( Ta no kami 田の神). The fact that farmers found that the amagaeru could predict the rain essential for agriculture only strengthened this belief. Stones statues can be seen at various shrines (or at people homes) around Japan. These might have been traditionally used for rain supplications ( amagoi) or to pray for recovery from various eye ailments (frogs have relatively large eyes). 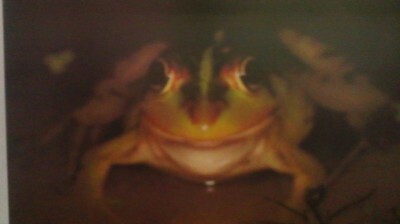 Frogs were also an important feature of folk medicine, and depending on the region were consumed (sometimes alive!) for various symtoms ranging from cancer to warts. 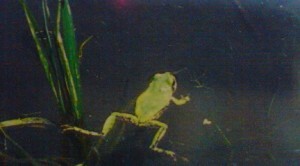 In some areas consuming frog was believed to be a cure for bed-wetting! 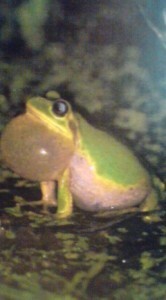 During the Edo Period (1600-1868),as many Japanese left the countryside and came to live in what was the biggest city in the world, Edo,and other cities, as well, the former peasants could wax nostalgic listening to the croaking of pet frogs (these were the fine voice KAJIKA-GAERU), which were all the rage at one point for their singing. Rick Weisburd and I have recorded the frog chorus around his house, and we will be uploading it as soon as we figure out how to do so. In the meantime, get out ( or just open your window) and have a good listen for yourself ! And last year when I originally wrote and posted this article, Tsukublog reader Mamoru Shimizu sent in a fantastic link to some old footage of The Duke Aces performing their hit: FROG CHORUS AT THE FOOT OF MT TSUKUBA- in which each member of the acapella group takes on the croak of a different frog! It’s really a nice and useful piece of info. I’m glad that you simply shared this helpful information with us.